The registration code should send within a few minutes. If you didn’t receive it over 10 minutes, please check your email account’s Spam or Junk folder to ensure the message was not filtered. If you still unable to find it, please contact us with your order no. and email address that filled in the order page. 2. Turn off your VPN (Virtual private network) if you have installed. When adapted online keycode checking system. It happens when you are offline or you connected to the Internet but with VPN. The solution for this would be: Connect to the internet or switch off your VPN (Virtual private network). If the above doesn’t work, please contact support to solve your problem. I play an album on Spotify the software creates a single file, what should I do? It happens when no gap in time between every two songs. We have tried to improve the accuracy rate of splitting song files. in case this happens, you can set the music play as “Random play ” mode so that to produce a slight gap time between every two songs and then our recorder can split it correctly. I see recorded music with the filename like Track 1, Track2 … Where is the ID3 tag? you are confusing the concept of “ID3 tags” and “filename“. What you saw in the folder is the mp3 files with the filename like track 1, track 2 … right? But It doesn’t mean NO ID3 tag included in the song. Right-click the MP3 file in the folder and click Properties. You will see all MP3 info, such as Title, Artist, Album and Compose. If you transfer recorded music to your MP3 player or phone. Your mp3 player will read that info, instead of showing a filename like track 1. Switch to your default media player if you use an external speaker like USB speaker or speaker built-in the big screen. Now, re-launch audio recorder to check if the issue has solved. 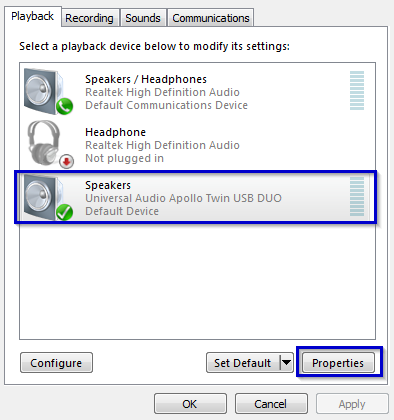 Changed configuration of the speakers in Windows? Another reason the record won’t work. 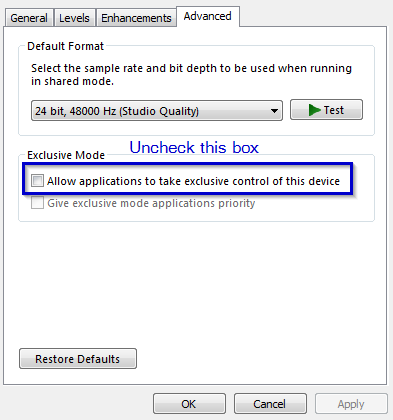 If you changed the configuration of the speakers in Windows like from 5.1 channels to stereo, or the bitrate to DVD Quality from Studio Quality. It doesn’t work if the speakers Cinch uses to record are set for more than 2 channels (stereo) or a bitrate higher than DVD Quality. if you are using anything higher the stereo on the speaker configuration on my PC soundcard during recording music (ex. 7.1 ,5.1 even quadrophonic) it doesn’t work. You can do playback on 7.1 or 5.1 but you must change back to stereo if you record music. This means the software can’t write data to your hard drive. If changed the output folder, it might happen because the folder you created doesn’t allow the recorder to save any data. To solve this problem, you should change the output folder where not on the C drive. That because other applications running on your computer take too much resource of the hard disk. It causes the recorded data can’t write to your hard disk. Try to shut down other apps when you are recording, leave more threads/resources to the recorder. If still doesn’t work, please restart your computer and only launch only the recorder and music player applications. When you have recorded a certain amount of songs, You should transfer all songs to your other music folder to avoid such “Not respond” issue. Because every time you launch the software, it will load all recorded songs’ info which takes many resources of your computer. That’s the main reason cause the issue. How to move music files? You could move those music files to your music player without launching the app. The current bitrate 320kbp/s for MP3 files. You can also save it as the lossless WAV file. In the new version, we set the MP3 bitrate to 320kbp/s. You can view it on “Settings“. There is an option that allows you to save recorded music as lossless WAV (5mins songs may take 50MB hard disk space). Important: The recorded file will have the same bitrate as the original music. Increasing of MP3 bitrate won’t get higher quality than the original one. No one can do that! For example, if you have set MP3 bitrate as 320Kbp/s, but the song you want to record is only 106Kbp/s, the output file will be 106Kbp/s NOT 320Kbp/s. Even you can force the recorded files to 128 or 320Kpbs, you will only get the bigger file size of recorded music but the quality is still the same. Because you just added some empty date to the recorded file. So, recorded music really depends on your original music, not by our software. If you have 320kbps music to record, you will get 320kpbs MP3 files. You can also save it lossless WAV file if you required higher bitrate. It may happen a 4-minute song is often recognized as 20 minutes long on Windows or iTunes. It can be fixed by a software called ‘MP3 Diags‘ to correct the VBR parameters. Will better PC or sound card improve recording quality? No. The quality of original music file matters.